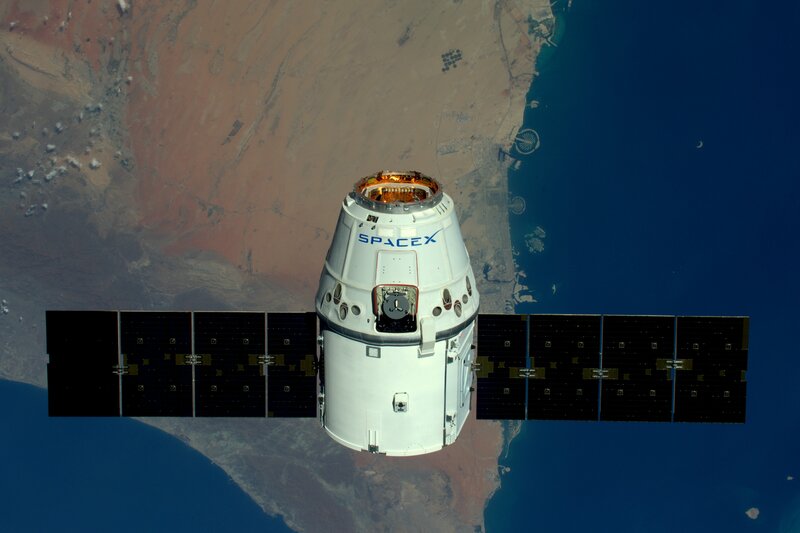 Dragon SpX-9 is the ninth operational cargo mission to the International Space Station carried out by the SpaceX Dragon under NASA’s Commercial Resupply Services Contract, ensuring a steady chain of supplies and equipment for the six crew members living and working in orbit. 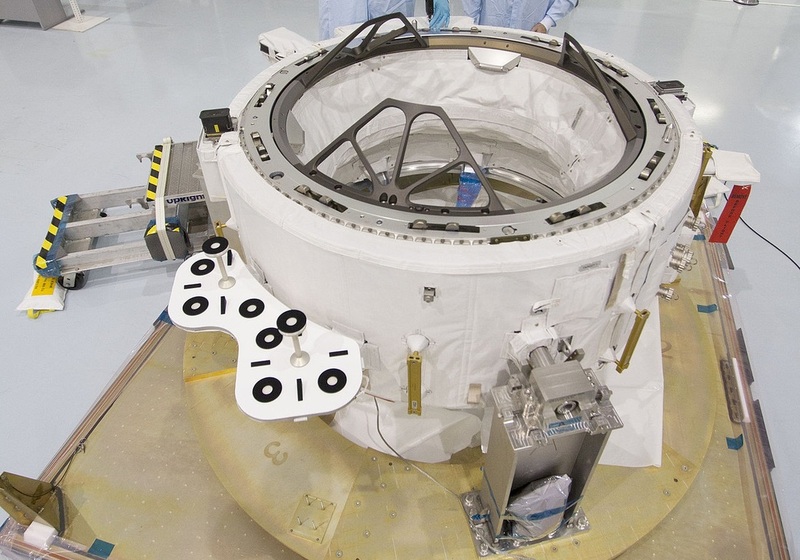 The SpX-9 mission is of great significance to the ISS Program, delivering an International Docking Adapter to outfit the complex for the start of Commercial Crew Missions in late 2017. 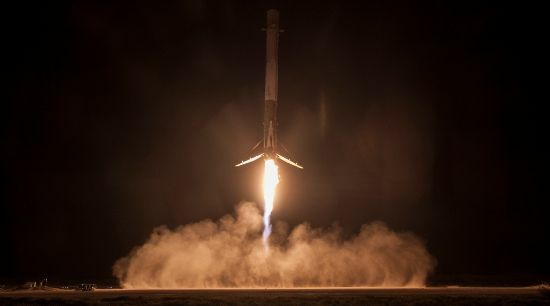 Dragon remains the only active vehicle that can return significant downmass to the ground, aside from the Russian Soyuz that can carry a few dozen Kilograms of cargo along with its three crew members. SpX-9 sets out to deliver 2,257 Kilograms of cargo to the Space Station and return over one metric ton to Earth by making a parachute-assisted splashdown in the Pacific Ocean. 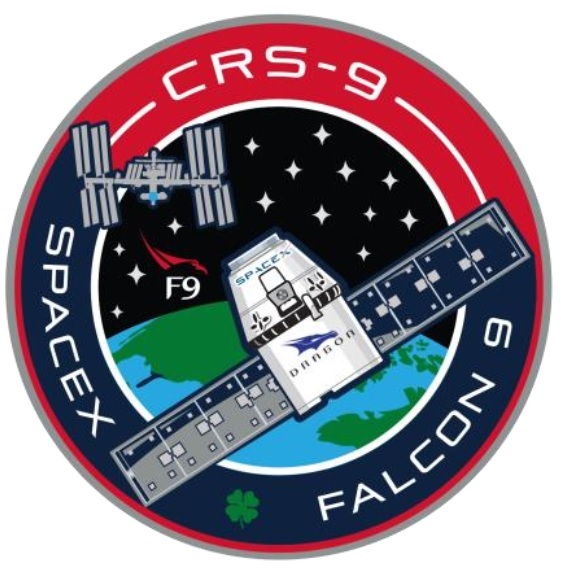 The Dragon SpX-9 cargo manifest is similar to that of previous missions, but also utilizes Dragon’s external cargo delivery capability. 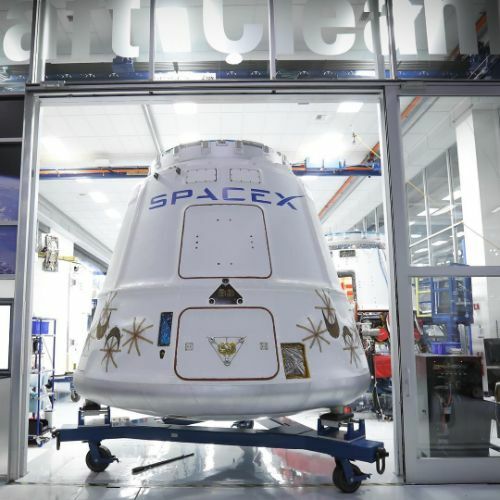 Riding in the Trunk Section of the spacecraft will be International Docking Adapter 2, amounting to 467 Kilograms of Dragon’s cargo upmass. Loaded into the spacecraft is a mix of science experiments, maintenance hardware for the various ISS systems, and supplies for the crew’s everyday life in obit. SpX-9 delivers 930 Kilograms of science materials, 370 Kilograms of crew supplies including food, clothing and hygiene equipment, 127 Kilograms of spacewalk hardware, 1kg of computer resources and 54kg of Russian hardware. 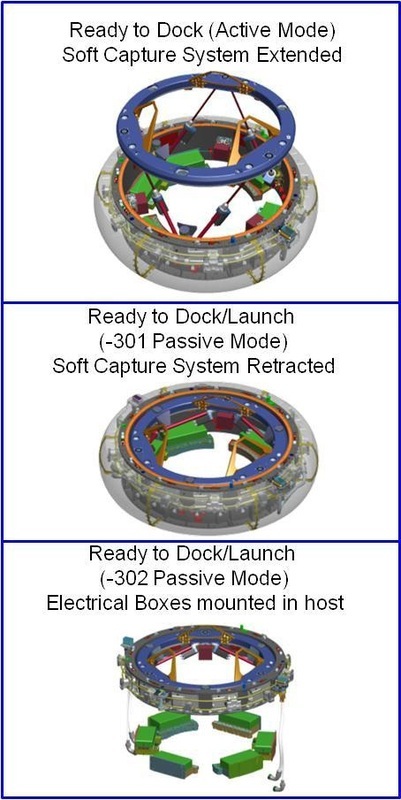 The major focus of the SpX-9 mission, besides science, is International Docking Adapter 2 – a critical part that needs to arrive at the Space Station – to be installed on one of the Station’s two Pressurized Mating Adapters in order to permit Commercial Crew Spacecraft to automatically dock to ISS. 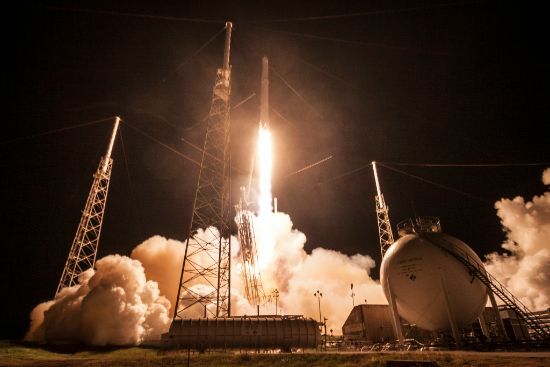 IDA-1, aboard the Trunk of the Dragon SpX-7 spacecraft, was lost when the Falcon 9 rocket lifting the spacecraft broke apart a little over two minutes into its June 28, 2015 launch. As a result, pressure is high to deliver IDA-2 to Station to keep up the Commercial Crew schedule. IDA-3 is being manufactured from spare parts to be launched as early as Dragon SpX-14. 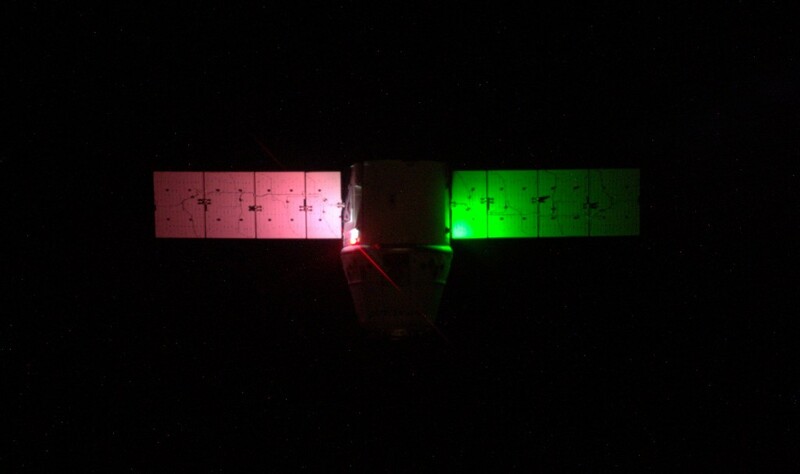 Dragon SpX-9 is booked for a stay of five weeks, residing on the nadir-facing port of the Harmony module where it will be unloaded by the USOS crew members and filled with various return items. 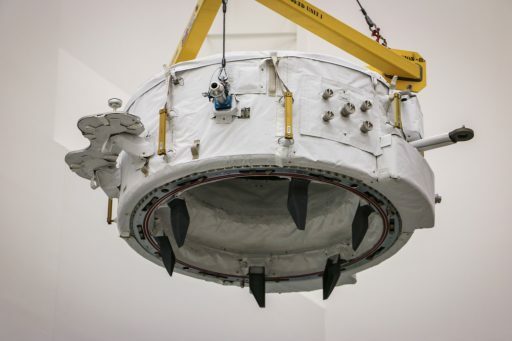 The removal of IDA-2 from Dragon’s Trunk will be completed by Canadarm2 while its installation on Pressurized Mating Adapter 2 will be finished via one or two spacewalks conducted in the summer by Jeff Williams and Kate Rubins. 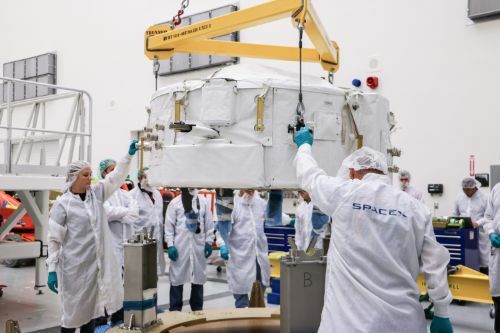 Dragon SpX-9 is delivering International Docking Adapter 2 to ISS, the first IDA to reach the Station after IDA-1 was lost in the Dragon SpX-7 launch failure. While a disappointment, the loss of IDA-1 did not impact the overall schedule of the Commercial Crew Program, however, it puts additional pressure on Dragon SpX-9 and the successful delivery of IDA-2 that will take the place of IDA-1. A third IDA is under construction from spare parts to be ready for launch in 2017. 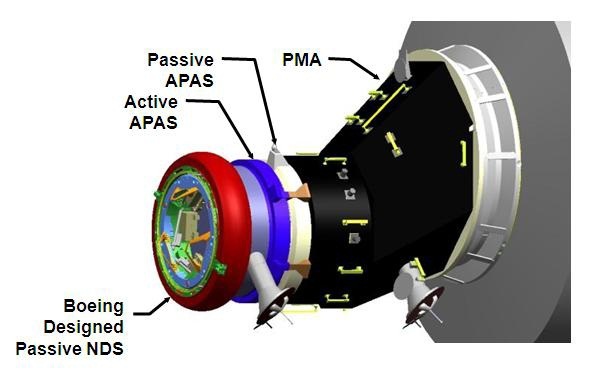 The Docking System includes a Soft Capture System that forms the initial connection between the spacecraft before pulling the two docking systems together to allow the Hard Capture System to form a rigid seal between the two spacecraft. Hooks are available on the active and passive side of the docking system, providing up to 24 attachment points. Overall, the system consists of a capture ring, guide petals, soft docking magnets, mechanical latches, magnetic striker plates, latch strikers and sensor strikers. The strikers are part of the passive system and provide contact surfaces for components of the active system. Soft capture can be achieved using magnetic or mechanical soft capture latches. 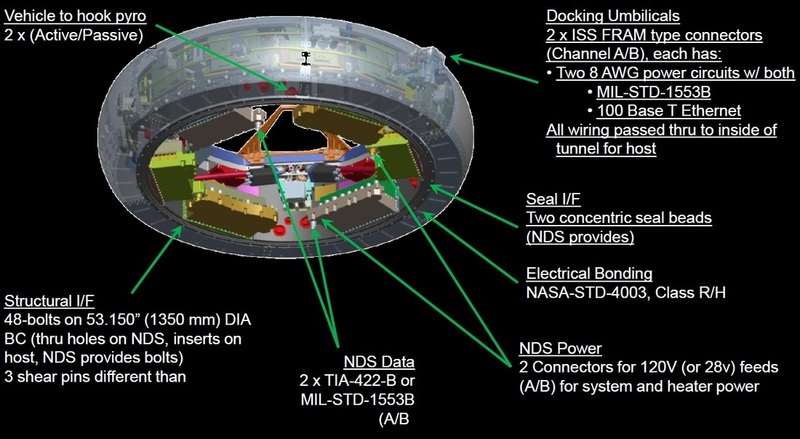 Due to the low force required for a Soft Capture, the NDS can support robotic berthing of a spacecraft. The installation of IDA-2 on Pressurized Mating Adapter-2 will take place in the Summer time frame while the installation of IDA-3 will be conducted once PMA-3 has been relocated from its current location on Node-3 to Node-2 zenith to establish a second docking port for SpaceX’s crewed Dragon spacecraft and Boeing’s CST-100 Starliner. Mouse Epigenetics, known by its full name of Transcriptome analysis and germ-cell development analysis of mice in the space, is a Japanese study looking at modifications in gene expression and DNA structure in the organs of male mice that spend one month in space. This is the first study to fly live mice to ISS and return them to Earth alive – previous studies euthanized mice in space and returned samples harvested in orbit for analysis on Earth. For the Mouse Epigenetics, the return of live mice is a critical aspect as it is aimed to identify genetic alterations in their offspring over multiple generations. Organisms exposed to the space environment experience a number of stress factors such as a lack of gravity and cosmic radiation which have an impact on gene expression patterns. To date, a number of studies have looked at DNA alteration in space, but analysis of long-term effects of the space environment on gene expression patterns over multiple generations has not yet been performed. Furthermore, Mouse Epigenetics assesses the impact of the space environment on mammalian germ cells by the production of offspring using the sperm cells exposed to the space environment. The experiment sends 12 mice to the International Space Station where they will live for 30 days before being sent back to Earth aboard the Dragon SpX-9 spacecraft. Back on Earth, the mice are to be euthanized and their internal organs will be subject of detailed study while their sperm is retrieved for in-vitro fertilization of new mouse embryos. Analysis of the returned mice and their offspring will reveal the long-term effects of space travel on a molecular level, including changes to gene expression and epigenetic modification. The experiment uses the Japanese Mouse Habitat sent to ISS last year. 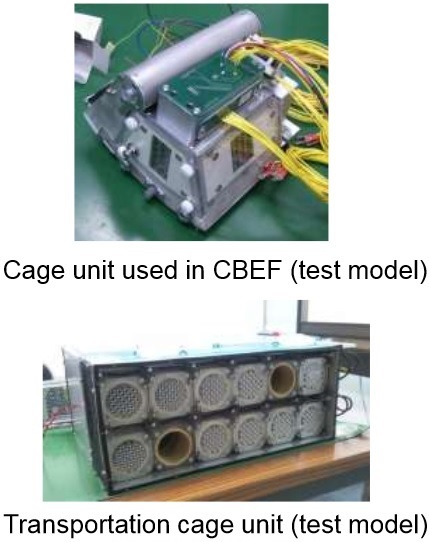 The Mouse Habitat Experiment consists of two major segments, the main Onboard Cage Unit for the accommodation of mice for 30 to 180 days and Transportation Cage Unit that accommodates the animals for up to ten days from launch to transfer to ISS and from the end of the ISS-based experiment to the return to Earth aboard a visiting vehicle. The Mouse Habitat will be set up in the Cell Biology Experiment Facility CBEF in the Kibo module that provides two research sections. One Cage Unit facilitating six mice will be set up in the Micro-g section where mice experience the full space environment (microgravity, radiation) and the artificial gravity section that makes use of the short-arm centrifuge of CBEF which had so far only been used to expose plants to an artificial gravity environment, but as ground studies have shown, the centrifuge is also suitable to create a gravity environment for small mammals. Having six mice exposed to artificial gravity takes the microgravity environment out of the equation so that a comparison between the micro-g experiment and artificial-G experiment can highlight the adverse effects caused solely by radiation and those caused by microgravity alone. This will be the first long-term experiment involving mammals in an artificial gravity environment. 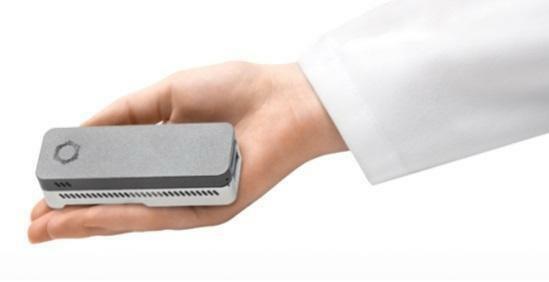 The Biomolecule Sequencer is a novel payload for in-orbit sequencing of DNA to add a powerful tool to the Station’s scientific repertoire as it allows more in-depth investigation into how living organisms respond to the spaceflight environment. This experiment aims to demonstrate for the first time that DNA can be sequenced in the space environment which would enable experiments to be completed on ISS and collected data to be downlinked to the ground instead of flying samples back to Earth for sequencing. 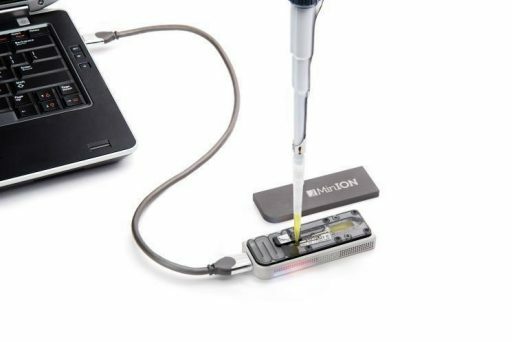 DNA sequencing in the space environment opens a portal to the identification of microbes, diagnosing diseases and improving crew member life during long missions, and – further down the road – help in the detection of DNA-based life elsewhere in the solar system. Currently, ISS does not have an operational molecular biology capability which is deemed to be of great importance for a number of factors such as operational environmental monitoring aboard a spacecraft (identification of microbes), assist in medical operations to improve countermeasure efficiency, deliver valuable data for research, and pave the way for future astrobiological research. 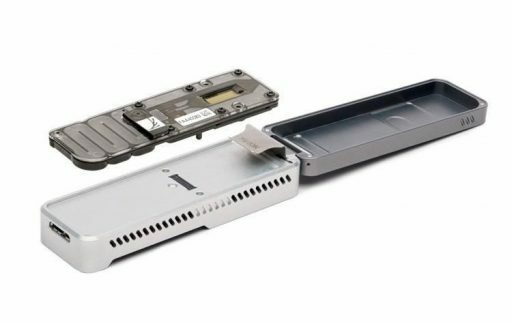 The Biomolecule Sequencer proof-of-concept will employ DNA from viruses, bacteria, and a mouse. If successful, the sequencing device will be available for in-flight microbial identification and research of permanent or transient changes undergone by an organism’s DNA when exposed to the space environment. The Phase Change Heat Exchanger (Phase Change HX) is a technology demonstration of a new type of heat exchanger for application on future spacecraft to better regulate temperatures, also applicable for future scientific systems requiring sub-zero fluid temperatures. The system is scalable and features a plug-and-play design with ease of use a primary driver of development. The principle behind a Phase Change Material Heat Exchanger (PCM HX) is storing energy by thawing a phase change material via a hot coolant. The material is then cooled and re-frozen by expelling heat through the spacecraft’s radiators. 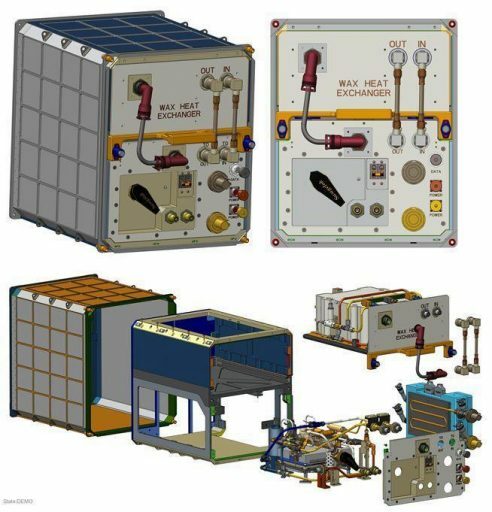 The Phase Change HX experiment will demonstrate numerous temperature and pressure settings with many thaw-freeze cycles over the course of the experiment run to demonstrate how effective the technology is in a microgravity environment. 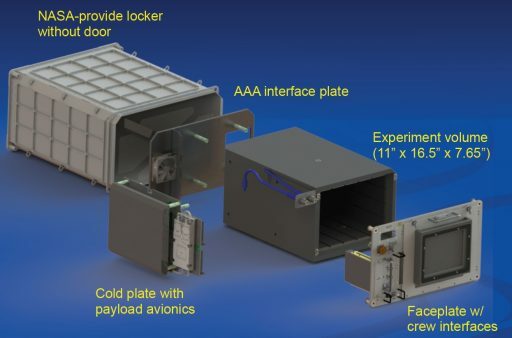 The experiment makes use of an EXPRESS Rack double locker to deliver all the required resources – power, data connectivity and connections to the Station’s thermal control loops. The system requires a pair of power connections, one data connection and interfaces with both, the Station’s Moderate Temperature Loop and Low Temperature Loop. Within the system is a Propylene Glycol Water (PGW) loop and a Thermal Electric Cooler (TEC) which delivers the -10°C fluid to freeze the heat sink. Strip-heaters reside within TEC to be able to support thermal control up to +30°C to melt the heat sink. 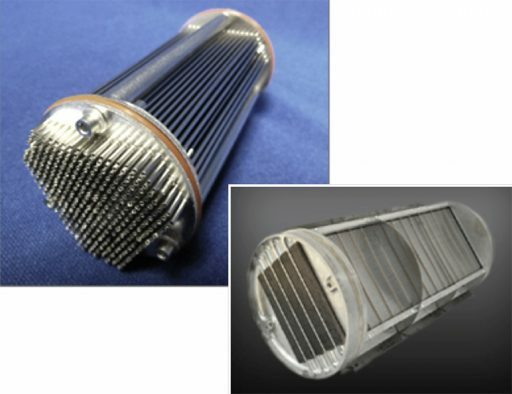 Phase Change HX are an emerging technology since they allow application as a supplemental heat rejection device during time-varying heat loads or changing mission environments – storing waste energy by melting the heat sink and rejecting waste energy through radiators when heat loads are low – thus reconditioning the heat sink. Phase Change HX systems employing wax as a heat sink have flown on the Apollo lunar rover and the Skylab space station, though have shown inconsistent results. Water-based systems offer a considerable mass saving because of the water’s superior energy storage capability. However, water heat exchangers of this type have not been tested in a microgravity environment due to additional challenges such as density changes associated with the phase change between liquid and frozen. The expansion issue of freezing water is addressed by using a microtube heat exchanger, currently under development. The first PC HX experiment run will be completed with a wax PCM before the water-based system is tested. The PC HX experiment will run for at least one month to demonstrate numerous freeze and thaw cycles without breaching the integrity of the heat exchanger. OsteoOmics, going by the full name of Gravitational Regulation of Osteoblast Genomics and Metabolism, tests whether magnetic levitation can accurately simulate free-fall conditions experienced in microgravity by comparing gene expression in bone cells between cells exposed to the actual space environment and ones under magnetic levitation on Earth. The identification of molecular changes that take place in magnetic levitation and real microgravity will help scientists assess the feasibility of ground-based studies of gravity-related changes in bone loss. Millions of people experience diseases characterized by bone loss because of an imbalance in bone modeling vs. bone dissolution, as seen in bed-ridden patients on Earth and astronauts in space. The study of the mechanisms of bone loss via the examination of signaling pathways and gene/protein expression is a therefore major focus of research. The study of bone physiology in a levitation magnet offers a new ground-based environment for the examination of signaling processes, however, it has to be verified whether this artificially created environment matches the orbital free fall by comparing osteoblast and osteoclast genomics, signaling pathways proteomics and metabolomics in both environments. Osteoclast and osteoblast cells are transported to ISS at -80°C until activation and placement into a Commercial Generic Bioprocessing Apparatus (CGBA) to deliver a regulated +37°C environment for a 30-day time period with automated media exchanges over several days and fixation of samples at three intervals at 6, 10 and 30 days. Concurrently, a similar experiment is run in a magnetic levitation environment on the ground to provide samples for comparison. Return of the experiment hardware is completed at -80 or +4°C. The Heart Cells Study – Effects of Microgravity on Stem Cell-Derived Cardiomyocytes – looks at the negative effect experienced by crew members in space flight with regard to their cardiac condition. It is known that prolonged exposure to microgravity weakens the human heart due to adverse effects on how heart muscle tissue contracts, grows and changes. Heart Cells studies these changes in a microgravity environment and also aims to understand why changes vary between subjects. A better understanding of how heart muscle cells – cardiomyocytes – change in space also provides valuable knowledge for studying heart disease and countermeasures in the form of drugs and cell replacement therapy for application in future space missions and for people with heart diseases on Earth. For an in vitro microgravity study on heart function, the ideal subject would be actual human heart tissues which are very difficult to obtain and maintain in culture through the launch and rendezvous phase of a cargo mission. Animal cells differ from human cells and are not suited for this study. 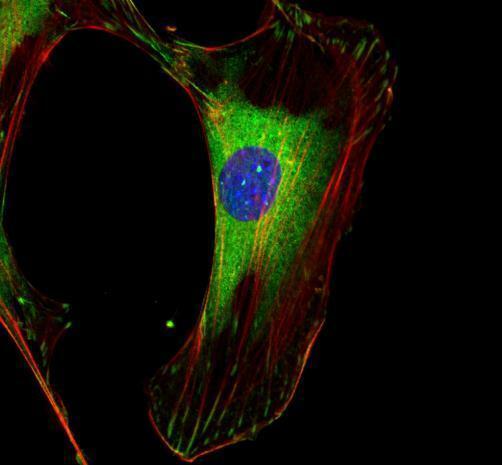 Instead, Heart Cells will use cells derived from human induced pluripotent stem cells which have emerged as a novel cell therapy in cardiovascular medicine. As part of the study, human induced pluripotent stem cells (hiPSCs) are produced from a diverse group of volunteers by collecting skin samples through which terminally-differentiated cells are obtained to then be reverted into their stem cell state. 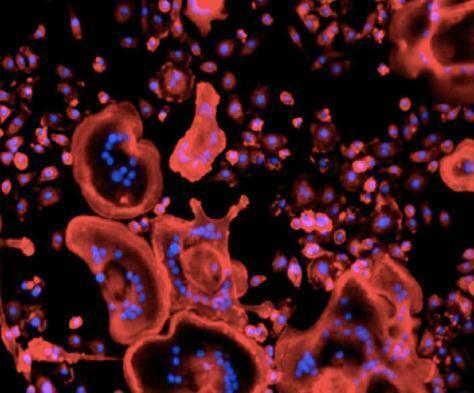 Heart Cells flies three test subjects and three replicates for each subject for a total of 18 samples to be cultured aboard ISS for a month with regular media exchanges. The cultures are kept in a controlled 37°C, 5% CO2 environment during their stay on ISS and their transfer to and from the laboratory. Six samples will be preserved on ISS and returned to Earth at +4°C while the others remain in culture conditions. 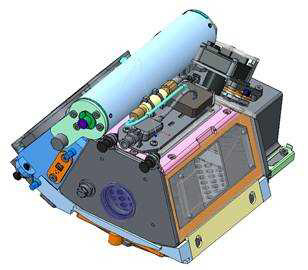 Imaging of the cultures is completed with an inverted microscope, built by BioServe. Incubation aboard ISS occurs inside SABL, the Space Automated Bioproduct Lab – a new space life science facility to be deployed on the International Space Station for a wide variety of research ranging from fundamental, applied and commercial space life sciences research to education-based investigations. The Space Automated Bioproduct Lab is an incubator facility to host cell culture and other biological experiments, supporting bacteria, yeast, algae, fungi, viruses, animal cells and tissues and small plant and animal organisms. Maritime Awareness, also known as Global AIS on Space Station (GLASS), deploys an experimental terminal for the Automatic Identification System on ISS to track ships and their movements around the globe. The Automatic Identification System (AIS) Terminal can record signals sent by the Automatic Identification System of ships using the VHF frequency. The Automatic Identification System is used by sea vessels that send and receive VHF messages containing identification, position, course and speed information to allow the monitoring of vessel movements and collision avoidance as well as alerting in the event of sudden speed changes. GLASS will deploy an AIS receiver to ISS to answer a number of questions on the feasibility of the operation of an AIS receiver based on Software Defined Radio Technology. The system’s capability of processing simultaneous AIS signals for multiple users and regions will be tested and so will be the use of long-range AIS data. 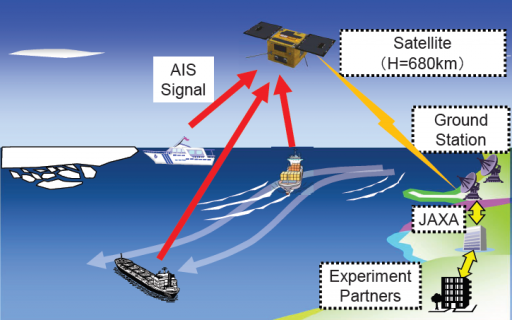 Additionally, the study will determine whether AIS data collected on ISS can support ongoing port operations and would be of value for trade, economic, resource management and national security analysis. The GLASS hardware is to be installed on Express Rack #3 via a standard ISIS Drawer and will be operated for at least one year. Gumstix – NanoRacks-Evaluation of Gumstix Performance in Low-Earth Orbit – deploys small computers known as Gumstix modules to ISS for an investigation into the effects of the radiation environment in Low Earth Orbit on electronics. Should the Gumstix modules be able to withstand the radiation environment on ISS, they would be a welcome alternative for off-the-shelf computing devices for use in space. The study evaluates the total number of soft errors occurring on the electronics, the AND or NOT AND Flash reliability, the occurrence of Logical Units and Single-Event Upsets with respect to the operating time of each module to obtain an idea of the expected uptime of future systems using this technology. Gumstix are Linux based computers that are small in size, power efficient and use current generation microprocessors as opposed to radiation hardened computers found on most spacecraft which are typically several generations behind the current state of technology. 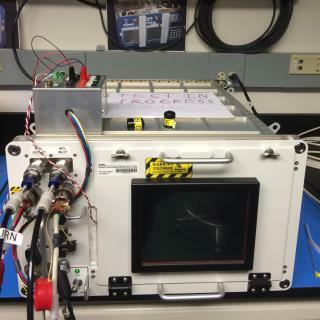 While Gumstix should be able to withstand a high Total Ionizing Dose, they may be susceptible to Single Event Effects which is to be studied as part of this experiment with performance analysis during and after exposure to the space environment. 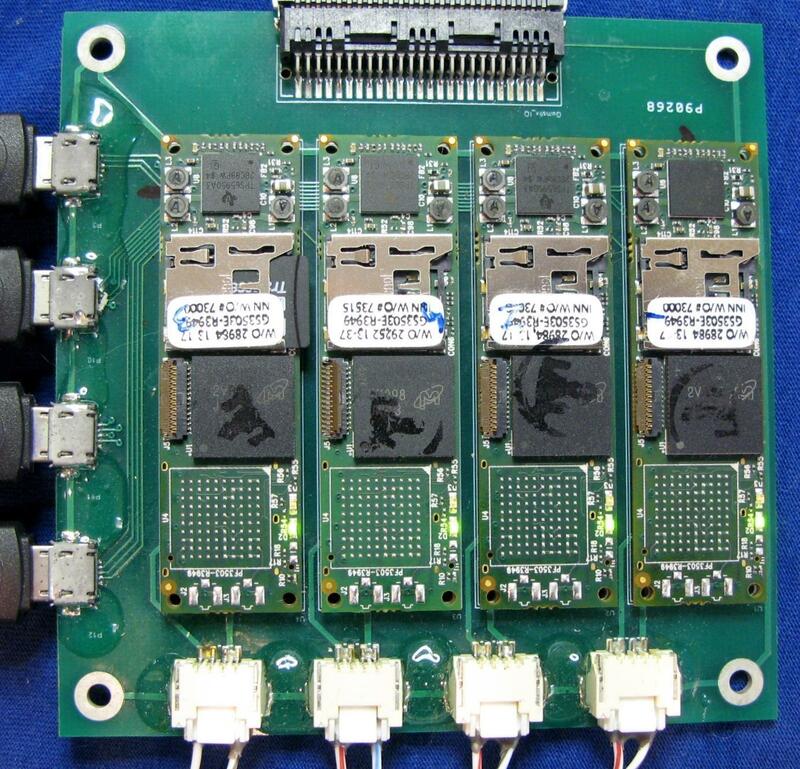 The Gumstix modules are to be installed on the exterior of ISS for a six-month period. Depending on the outcome of the study, Gumstix may find application in small satellites for communications and remote sensing research. 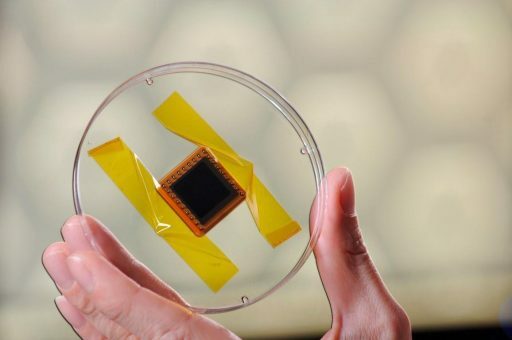 The NanoRacks Nano Tube Solar Cell, going by the full name of NanoRacks-Earth Abundant Textured Thin Film Photovoltaics, investigates a new type of three-dimensional solar cell that provides a higher efficiency in the conversion of solar illumination to electrical power. This experiment aims to study the performance of the new solar cells under continually changing sun angles and the harsh thermal and radiation environment found in Low Earth Orbit. Carbon nanotube (CNT) based textured photovoltaic (PV) cells use Copper zinc tin sulfide (CZTS) as photoabsorber instead of the toxic and rare cadmium telluride. The experiment aims to verify the optimal configuration of copper, zinc, tin and sulfide layers within the CZTS stack and the cell’s degradation over the course of its stay on ISS. The varying sun angle in the station’s orbit provides a welcome opportunity for electrical characterization. 3D PV Cells have the major advantage of being fabricated in a bottom-up configuration, allowing them to be produced on metal foils to generate lightweight and flexible solar arrays. Conventional PV devices are built from top-down and are by design inflexible due to the need for a cover glass. Another advantage of the 3D PV cells is efficient power generation at off-normal angles to the sun, eliminating the need for solar tracking mechanisms which in turn reduces spacecraft mass. This is due to the 3D geometry provided by the vertically aligned carbon nanotubes, allowing for multiple photon impingements when the solar flux is at off-normal angles of incidence – thus increasing the odds of photons being absorbed. 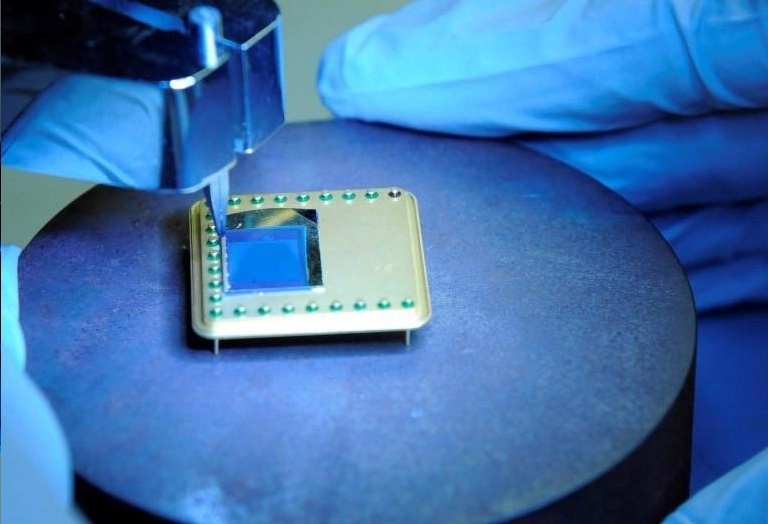 NanoRacks Nano Tube Solar Cell resides on the NanoRacks External Platform (NREP) installed on the JEM Exposed Facility for a space exposure of six months or longer. 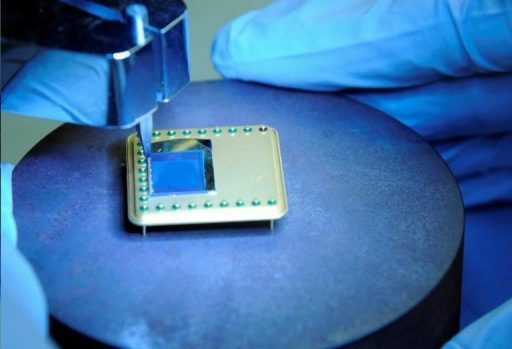 As part of the experiment, solar cell voltage and current as well as temperature and solar angle are recorded to obtain a complete picture of the cell’s performance over an extended period of time. Dragon is delivering Nitrogen/Oxygen Recharge System (NORS) Recharge Tank Assemblies (RTA) to the Space Station marking the second flight of this new generation of gas resupply missions aboard Commercial Cargo Vehicles. In previous years, breathable air for ISS repressurizations was delivered by the European ATV and the Russian Progress. With ATV flying its final mission in 2014/15, future ISS repressurizations rely on Progress and NORS alone. The NORS RTAs are designed to re-fill the station’s existing air supply network that used to be replenished by the US Space Shuttle. Pressurized gas from that system is used in the repressurization of the ambient atmosphere of ISS, to deliver Oxygen to the astronauts when the Station’s primary systems fail, operate the Quest airlock and pressurize the Station’s cooling systems. 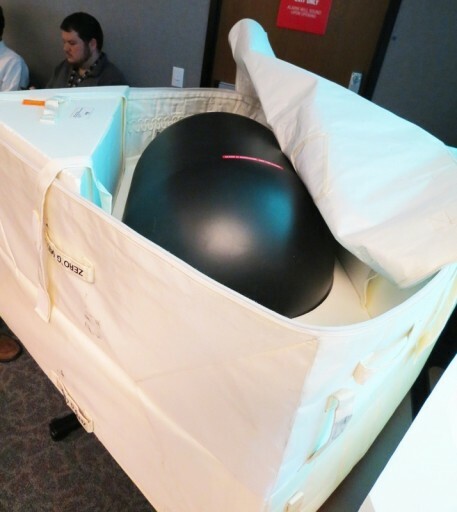 Each of the NORS RTAs is about 90 centimeters long, 53cm in diameter and weighs 109 Kilograms, either carrying pressurized oxygen or nitrogen. Each tank is pressurized to over 400 bar, more than twice the pressure of previous tanks. Overall, 37 tanks were expected to be manufactured to be sent to the station multiple times since the tanks are fully re-usable.